The 1989 World Series was the 86th edition of Major League Baseball's championship series, and the conclusion of the 1989 Major League Baseball season. A best-of-seven playoff, it was played between the American League (AL) champion Oakland Athletics and the National League (NL) champion San Francisco Giants. The Series ran from October 14 through October 28, with the Athletics sweeping the Giants in four games. It was the first World Series sweep since 1976, when the Cincinnati Reds swept the New York Yankees. The four game sweep by the Athletics at the time would mark only the third time in World Series history that a team never trailed in any game, with the 1963 Los Angeles Dodgers, 1966 Baltimore Orioles, and 2004 Boston Red Sox being the only other times this occurred, and the first in the playoff era (post-1968). This marked the fourth World Series matchup, and first since 1913, between the two franchises. The previous three matchups occurred when the Giants were in New York and the Athletics resided in Philadelphia. The then New York Giants defeated the Philadelphia Athletics in the 1905 World Series four games to one, the Athletics defeating the Giants in the 1911 World Series four games to two, and then again in the 1913 Fall Classic four games to one. The series would be historic in other ways as well: the 76-year gap between matchups was the longest in World Series history, a record this World Series would hold until 2018 when the Red Sox and Dodgers met for their first World Series meeting in 102 years; it also marked the first time two franchises had faced off in the World Series after having once played each other when both were based in a different city. Fay Vincent, who had just taken over as Commissioner of Baseball after the sudden death of his predecessor Bart Giamatti in September, presided over his first World Series and dedicated it to his predecessor's memory. This Series was also known as the "Bay Bridge Series," "BART Series," "Battle of the Bay," and "Earthquake Series" as the two participant cities lie on opposite sides of San Francisco Bay, connected by the San Francisco–Oakland Bay Bridge and the Bay Area Rapid Transit (BART) system, and the 1989 Loma Prieta earthquake that occurred before the start of Game 3. It was the first cross-town World Series (involving two teams from the same metropolitan area) since 1956, and only the third such series that did not involve New York City (the 1906 and 1944 World Series, which featured matchups between Chicago and St. Louis teams, were the others). On October 17, just minutes before the scheduled start of Game 3, a magnitude 6.9 earthquake struck the Bay Area causing significant damage to both Oakland and San Francisco. Candlestick Park in San Francisco suffered damage to its upper deck as pieces of concrete fell from the baffle at the top of the stadium and the power was knocked out. The game was postponed out of concerns for the safety of everyone in the ballpark as well as the loss of power, with Vincent later saying that he did not know when play would resume. The series resumed on October 27 and finished the next day. The San Francisco Giants won the NL West division by three games over the San Diego Padres, then defeated the Chicago Cubs four games to one in the National League Championship Series. The Oakland Athletics won the AL West division by seven games over the Kansas City Royals, then defeated the Toronto Blue Jays four games to one in the American League Championship Series. It was the Giants' first World Series appearance since 1962, while the Athletics were playing in their second straight Fall Classic following the 1988 Series. † Game 3 was originally slated for October 17 at 5:35 pm; however, it was postponed when an earthquake occurred at 5:04 pm. Prior to Game 1, a tribute to late Commissioner Bart Giamatti was held; Giamatti's son Marcus threw out the first pitch, and the Whiffenpoofs from Yale University (Giamatti's alma mater) sang the national anthem. Dave Stewart, the Athletics' ace, took on Giants pitcher Scott Garrelts in Game 1 of the Bay Bridge series. Oakland took the lead in the bottom of the second when Dave Henderson walked, advanced to second on a Terry Steinbach single, and scored on another single by Tony Phillips that moved Steinbach up to third. Walt Weiss then sent a soft ground ball toward first, but Giants first baseman (and NLCS MVP) Will Clark threw the ball low and to the right of catcher Terry Kennedy. Steinbach knocked the ball out of Kennedy's mitt, scoring the second run of the inning. Kennedy was charged with an error, and Phillips advanced to second. Rickey Henderson then drove in Phillips on a single to right field; the second inning ended with Oakland leading 3–0. A's designated hitter Dave Parker tattooed a home run to lead off the third off of Garrelts, and Weiss added a lead off home run in the fourth. Oakland starter Stewart dominated the Giants, allowing five hits in a complete game, handing the A's a one-game edge in the Series. "We ran into a buzz saw", Clark said of Stewart's pitching. Little League World Series MVP and future NHL star Chris Drury threw out the ceremonial first pitch in Game 2. Oakland starter Mike Moore took on Giant Rick Reuschel. Oakland got off to a fast start; Rickey Henderson led off the bottom of the first with a walk. Henderson promptly stole second, and scored one pitch later when Carney Lansford hit a double to right field. The Giants scored their first run of the Series in the top of the third; José Uribe reached first on a fielder's choice, advanced to third via a Brett Butler single, and scored on a Robby Thompson fly ball. The A's regained the lead in the bottom of the 4th when Dave Parker drove a line shot off the wall that was both an inch from being foul and an inch from being a home run. Jose Canseco, who drew a walk earlier that inning, scored on the play. Parker stood at the plate for a moment to watch the flight of the ball, and started to run as soon as the ball hit the wall; Giants right fielder Candy Maldonado appeared to throw Parker out at second, but second base umpire Dutch Rennert called Parker safe. After Dave Henderson walked and Mark McGwire struck out, Terry Steinbach hit a three-run home run off Reuschel to left field, scoring both Parker and Henderson. The Giants had no answer for Oakland's relievers, and the A's won 5–1 and took a 2–0 lead in the Series. The Loma Prieta earthquake struck on October 17, 1989, at 5:04 p.m. Game 3 was scheduled to start at 5:35 p.m. at Candlestick Park in San Francisco, and thousands of people were already in the stadium when the quake occurred. Because of the coincidence of timing, it was the first major earthquake in the United States ever to be broadcast by live television. 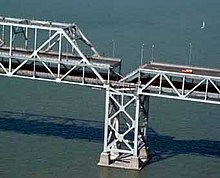 Experts credit the timing of the Series as a lucky break that prevented massive loss of life in the region; key in reducing the loss of life was the fact that many people on both sides of the bay had left work early or were staying late to participate in after-work group viewings and parties, reducing the traffic that would otherwise have been on the collapsed freeways at 5:04 on a Tuesday (initial expectations were that hundreds of people had died in the collapse of Interstate 880 in Oakland; the final death toll from that event was 42). A Goodyear Blimp that was covering the telecast was used to coordinate emergency efforts. At the time the earthquake hit, ABC's crew was in the booth as Tim McCarver was presenting a highlight package. The earthquake hit while the video was playing and temporarily knocked the feed out, and just before it was knocked out Al Michaels could be heard on air saying "I'll tell you what, we're having an earth-" with the feed cutting out just before he finished. Michaels, McCarver, and third man in the booth Jim Palmer grabbed for whatever they could to brace themselves and inadvertently grabbed one another's legs, leaving all three men with thigh bruises. The audio was restored, with Michaels talking over a screen bumper until the video was restored saying jokingly that the earthquake jolt was "the greatest opening in the history of television, bar none." By contrast, the broadcasting team in the CBS Radio booth next door, consisting of Jack Buck, Johnny Bench, and John Rooney, were off the air when the earthquake started because their show was in a pretaped segment being played from New York. Bench ran to a spot underneath a steel grate, to which Buck later quipped, "If he moved that fast, he'd never hit into a double play. I never saw anyone move that fast in my life." The ESPN live coverage of the Series (ESPN and ABC at the time produced separate broadcasts) was interrupted during then-television analyst Joe Torre's pre-game report on the field. Their equipment van was the only one with a generator, and they continued their live coverage with Chris Berman and Bob Ley. In the immediate aftermath of the earthquake, ABC aired a rerun of Roseanne (and later, The Wonder Years) before Ted Koppel began anchoring news coverage from Washington, with Michaels acting as a de facto reporter. The Goodyear Blimp (which was already aloft for the game) provided video of structural damage and fires within the city. The ABC opening for this telecast (leading up to Al Michaels informing the viewers of the earthquake) was used at the beginning of a 1990 television movie (documenting the Loma Prieta earthquake) called After The Shock. Players for the Oakland Athletics returned home, but had to travel via State Route 237 in San Jose, adding an extra 90 minutes due to the collapse of the Bay Bridge and the I-880 Cypress Street Viaduct. Not long after returning, Jose Canseco (still in full uniform) and his wife Esther were spotted filling up their car at a self-service gas station. As noted in his later book Juiced, Canseco noted that someone wrote an article portraying him as chauvinistic forcing his wife to pump the gas, but that in reality, she told him to let her do it because if people saw him in his full uniform, it would cause a scene. The earthquake would affect the National Anthem performances for the games at Candlestick Park as well. Stevie Wonder, who was slated to play the National Anthem on his harmonica at Game 3 on October 17, pulled out days following the earthquake, and in his place Larry Gatlin and the Gatlin Brothers, who had been slated to perform at Game 4 on October 18, would sing the National Anthem when Game 3 was finally played on October 27. Dave Henderson just missed hitting three home runs for the A's as his first inning shot bounced off the top of the wall for a double. Giants catcher Bill Bathe became the fifth National League player in World Series history to hit a home run in his very first at-bat. When Game 3 was originally scheduled for October 17, the scheduled starting pitchers were Bob Welch for the A's and Don Robinson for the Giants. Meanwhile, Ken Oberkfell was slated to start at third base for the Giants, with Matt Williams moving over to shortstop instead of the benched José Uribe. Also, Pat Sheridan was slated to take over for Candy Maldonado in right field for the Giants. Maldonado told ESPN that he was in the clubhouse getting ready when the earthquake hit. The first person he saw in the midst of all of this was his teammate, Robinson, who told Maldonado that he sensed that an earthquake was occurring. For Oakland, Ron Hassey was slated to be the starting catcher for Game 3 in place of Terry Steinbach, as Hassey was at the time Welch's personal catcher. This game set a record for most combined HRs hit in a World Series game (7) as well as tying a record for most HRs hit by a single team (5) in a World Series game (the New York Yankees won Game 4 of the 1928 World Series against the St. Louis Cardinals, which like this series, would end in a sweep). This record for combined HRs in a World Series game would endure until Game 2 in 2017, in which the Astros and Dodgers combined for 8 HRs. At the time, October 28 was the latest end date ever for a World Series, even though the series only lasted the minimum four games. (The 1981 Series, which went six games, had also ended on October 28. This record was tied again in 1995, and has since been surpassed several times, beginning with the terrorism-delayed 2001 Series, which ran from October 27 through November 4. The World Series now regularly concludes at the end of October or beginning of November due to the addition of the Division Series and Wild Card Games to the postseason.) After Nell Carter sang the National Anthem, Willie Mays (who was initially scheduled to throw out the first pitch on October 17 and was about to be interviewed by ABC's Joe Morgan when the earthquake hit) threw out the ceremonial first pitch. The A's led from the first batter of the game on as Rickey Henderson's home run set the tone. Kevin Mitchell's homer would bring the Giants closer as they cut an 8–0 deficit to 8–6 in two innings. But it would prove to be too little too late for San Francisco as they would lose 9–6. This was also Candlestick Park's final World Series game. The Giants' four subsequent National League pennants have come since their move to AT&T Park, in 2002, 2010, 2012 and 2014 (with the last three instances having also ended in World Series championships as well). Out of respect for the Loma Prieta earthquake victims, the Oakland Athletics chose not to celebrate their World Series victory with champagne, as is normally customary for the winning team in the World Series. 1989 World Series (4–0): Oakland Athletics (A.L.) beat San Francisco Giants (N.L.). ABC Television immediately put this World Series slide on air following the loss of signal from Candlestick Park as a result of the Loma Prieta earthquake. ABC play-by-play man Al Michaels, who spent three years in San Francisco as an announcer for the San Francisco Giants, was nominated for an Emmy Award for news broadcasting after giving an eyewitness account of the aftermath of the earthquake at Candlestick Park. This would be the last World Series that ABC would televise from start to finish (and also the last they would produce themselves), and Game 4 was the last MLB game on ABC until July 1994. The television rights would move exclusively to CBS the following year (ABC had shared coverage with NBC since 1976 up until the end of the 1989 season). ABC would next televise a World Series in 1995, but only broadcast Games 1, 4, and 5 (the other games were covered by NBC, who had a joint venture with ABC and MLB called The Baseball Network). Due in part to the earthquake and subsequent interruption of play, as well as the four-game sweep by the A's, ABC only drew an overall Nielsen rating of 16.4 for the Series. This was the first World Series since the introduction of prime-time games in 1971 to draw a rating of less than 20. As previously mentioned, CBS Radio also covered the Series. Jack Buck returned for his seventh and last World Series as the radio voice for CBS, as he was to move to the television side the next year. He was joined by Johnny Bench as his analyst, who replaced Bill White when he was appointed to replace Giamatti as president of the National League earlier in the year. Buck was replaced by Vin Scully the next year, who made his return to CBS Radio following NBC Sports' loss of television rights to CBS. Bench covered four more World Series for CBS Radio with the 1993 series being his last. The A's would return to the World Series the following season, making it three years in a row. However, they were unsuccessful in defending their championship as the Cincinnati Reds swept them in the World Series. Oakland has not returned to the World Series since then and has only made two appearances in the American League Championship Series—losing in 1992 to the Toronto Blue Jays and in 2006 to the Detroit Tigers—and a total of eight times in the postseason (1992, 2000, 2001, 2002, 2003, 2006, 2012, 2013, 2014 and 2018) since this Series. At the time of the 1989 World Series, the Oakland franchise had not seen a World Series win since 1974. The Giants, meanwhile, failed to repeat as National League Champions and would not return to the playoffs until 1997, when they were swept by the Florida Marlins in the NLDS. The Giants would not return to the World Series until 2002, when they lost a seven-game series to the Anaheim Angels after holding a 3–2 series lead. It took the Giants until 2010 to get back to the World Series, and they won their first world championship since 1954, when the team was still located in New York, by defeating the Texas Rangers in five games. In 2012, the Giants would go back to the World Series and defeat the Detroit Tigers in a four-game sweep, and in 2014 they would beat the Kansas City Royals in seven games to capture their third World Series crown in five seasons. On the A's, players Mark McGwire and Jose Canseco would later play for other teams. McGwire would be traded to the St. Louis Cardinals in 1997, where he would beat Roger Maris' single-season home run record in 1998 and retire as a Cardinal in 2001. Canseco was traded during the 1992 season to the Texas Rangers and after that bounced around from team to team including a return to Oakland in 1997. He would later win the 2000 World Series with the New York Yankees. Canseco retired in 2001 after a stint with the Chicago White Sox. Manager Tony La Russa remained with the A's until 1995, when he resigned to take the managerial position in St. Louis, where he again got the chance to manage McGwire. La Russa would remain with the Cardinals for the rest of his career, retiring in 2011 after having led the team to three World Series and two world championships. Giants manager Roger Craig (affectionately known as "Humm Baby") was fired after 1992 season and replaced by Dusty Baker, who managed the team to their next World Series. The final member of the 1989 team, Matt Williams, was traded to the Cleveland Indians after the 1996 season in a trade that brought future Giants star Jeff Kent to the team. Williams would eventually win a World Series as a member of the Arizona Diamondbacks in 2001, and retired in 2003. Kevin Mitchell would never regain the form that helped him win the National League MVP award in 1989, and after his production declined in the next two seasons he was traded to the Seattle Mariners in the 1991 offseason. Brett Butler would leave after one more season with the Giants, going to play for the Los Angeles Dodgers. Wins leader Rick Reuschel was gone after the following season, retiring in 1991. Finally, Will Clark was let go by the Giants after 1993 due to a decline in production thanks in large part to injuries that kept him out of the lineup for much of the previous three seasons. Clark signed with the Texas Rangers and despite not being able to escape the injury bug, he was a productive member of the team for the next five seasons. Clark retired following the 2000 season, where he made one last trip to the postseason as a member of La Russa's Cardinals. On June 13, 2009, immediately prior to the second game of the interleague regular season meeting between the Giants and A's, the Giants honored 27 members of their 1989 team. The A's victory continued a string of success for any Bay Area-based professional sports team. The San Francisco 49ers of the NFL continued its '80s dynasty by winning Super Bowl XXIII and XXIV in between the Athletics' World Series triumph. The next championship for the city of Oakland came in 2015, when the Golden State Warriors of the NBA won the 2015 NBA Finals. Later, the Golden State Warriors would win the 2017 and 2018 NBA Finals, defeating the Cleveland Cavaliers. This would be the first time that the World Series ended in the last week of October, until the 2001 World Series when the 9/11 attacks delayed the NFL and MLB games for a week, and caused the World Series to end in November. The 1981 World Series also finished on October 28. ^ The black armbands that the Athletics and Giants wore were in memory of the deceased commissioner. In addition, the official World Series balls had Giamatti's signature on them. The Rawlings 1989 World Series Game Baseball. Archived October 22, 2006, at the Wayback Machine The ball features the World Series logo in Blue, traditional red stitch, and the printed signature of A. Bartlett Giamatti, Commissioner of MLB. ^ "1989 World Series Game 1 – San Francisco Giants vs. Oakland Athletics". Retrosheet. Retrieved September 13, 2009. ^ "1989 World Series Game 2 – San Francisco Giants vs. Oakland Athletics". Retrosheet. Retrieved September 13, 2009. ^ "1989 World Series Game 3 – Oakland Athletics vs. San Francisco Giants". Retrosheet. Retrieved September 13, 2009. ^ "1989 World Series Game 4 – Oakland Athletics vs. San Francisco Giants". Retrosheet. Retrieved September 13, 2009. ^ a b c d e Wulf, Steve (June 10, 2008). "On a Roll". Sports Illustrated. Retrieved June 10, 2008. ^ Keown, Tim (October 16, 2014). "When the earth moved the Series". ESPN. Retrieved April 14, 2019. ^ Malinowski, Eric (October 14, 2014). "Fay Vincent Gets The Last Word". Fox Sports. ^ Chass, Murray (October 27, 1989). "WORLD SERIES; After a Record 11-Day Delay, World Series Ready to Resume". The New York Times. Retrieved October 29, 2014. ^ Chris Keller (October 26, 2017). "Game 2 sets World Series records for combined home runs, extra-inning home runs". Los Angeles Times. Retrieved October 29, 2017. ^ "San Francisco Earthquake History 1915–1989". Virtual Museum of the City of San Francisco. Archived from the original on February 25, 2011. Retrieved March 23, 2011. ^ "World Series Television Ratings Breakdown". Baseball Almanac. Retrieved November 2, 2011. Forman, Sean L. "1989 World Series". Baseball-Reference.com – Major League Statistics and Information. Archived from the original on November 30, 2007. Retrieved December 9, 2007. History of the World Series - 1989 at The SportingNews. Archived from the original on 2008.